Frozen Tropics: Got New Year's Plans? 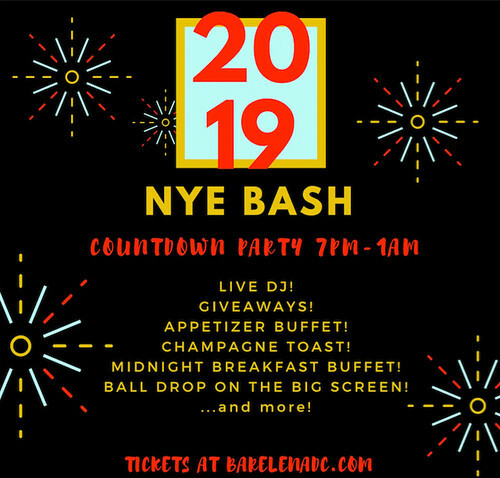 Looking for some last minute New Year's Plans? If so, fear not. You can still snag tickets to, or reservations for, many local spots. I've put together a list below. I'm sure I forgot some places, so feel free to mention those in the comments. 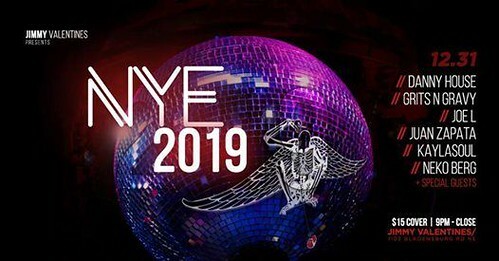 Bar Elena – This New Year's Eve party has a lot going on. There's a live dj all night, free skeeball, an appetizer buffet, hourly giveaways, and a midnight breakfast buffet. Watch the ball drop on the big projector screen while you celebrate with noisemakers and a champagne toast. Full bar available à la carte. The celebration starts at 7pm. Tickets are $75. 414 H St. NE. Duffy's Irish Pub – A $75 ticket gets you open bar on all beer and most liquor (shots are not included). The beer list is subject to change, but here's the tap list from the event page (Guinness, Hellbender Ignite IPA, Miller Light, and Stella). They also have more than 40 beers in bottles and cans. The event runs from 9pm to 1:30am, with a free appetizer buffet from 9–11pm. Party favors and a dj included. Irish whiskey toast at midnight. 1016 H St. NE. 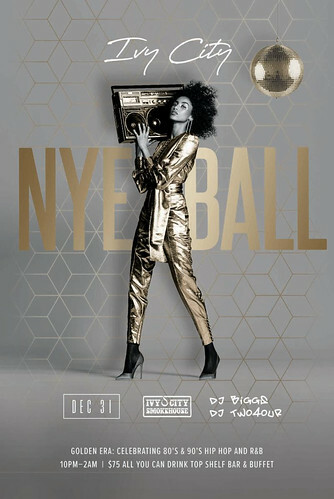 Ivy City Smokehouse – Ring in the new year while listening to the sounds of 1980s and 1990s hip hop and R&B courtesy of DJ Biggs & DJ 2two4our. All you can eat buffet, all you can drink top shelf, and a champagne toast. The party starts at 10pm. Tickets are $75, and they appear to have a buy three get one free offer. 1356 Okie St. NE. Jimmy Valentine's Lonely Hearts Club – No need to buy tickets in advance for the celebration here. It's just a $15 cover at the door. The party starts at 9pm with djs all night. 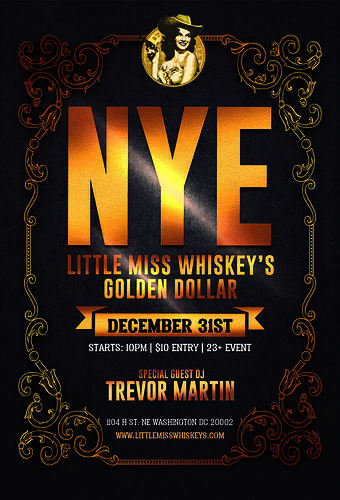 Little Miss Whiskey's Golden Dollar – General admission tickets are $10, and their open bar option is $75. The Eventbrite indicates this event is 23+. 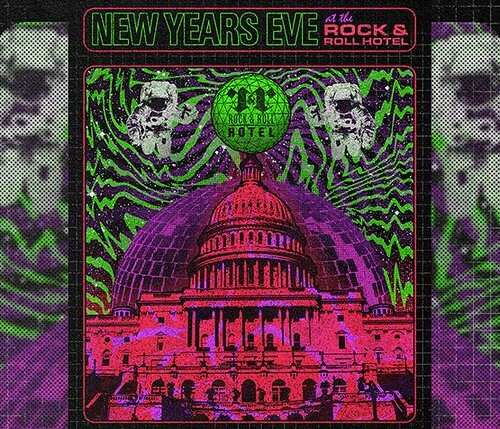 Rock & Rock Hotel – The Hotel once again hosts their popular New Year's Eve bash. with a full line-up of djs on the first two floors (Deejay Life, RVSSLL, SALAMANDER, SHARKEY, Confetti The First, STANDINGONSTARDUST, Dr. Drej). The roof deck and bar will be open. Appetizers and hors d'oeuvres will be available on a first come first served basis starting at 8pm. Open bar all night. Complimentary photo booth from 9pm–1am. 21+ only. Coat and bag check available. Doors open at 8pm. Tickets are $85 right now, but will cost you $100 the day of the event (if they aren't sold out by then). 1353 H St. NE. If a blow-out party is not your thing, you have some excellent dining options. 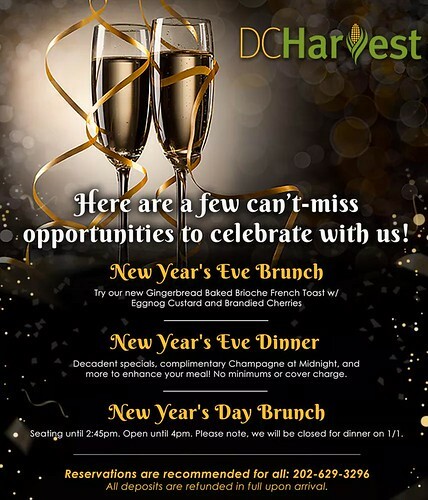 DC Harvest – Order off the regular menu, or try one of the festive specials available for the evening. Complimentary champagne at midnight. They are also offering brunch New Year's Eve and New Year's Day. 517 H St. NE. Gravitas – Indulge in a five course tasting menu for $95 a person. 1401 Okie St. NE. La Puerta Verde – The Mexican restaurant will offer a fixed price option served family style for $38 per person, or you can choose to order off their regular menu. Complimentary champagne toast at midnight, holiday cocktails, and party favors. 2001 Fenwick St. NE. Sospeso – Enjoy a three course fixed price menu ($60) devised by Executive Chef Lauren Sanders. Add wine pairings selected by beverage guru Mike Rosato for $35. Reserve your table through the restaurant's website. 1344 H St. NE.